(a) Install the claw to the overhaul handle, inserting it into the hole in part A as shown in the illustration. 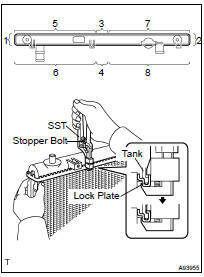 Using SST to release the caulking, grip the handle until stopped by the stopper polite uncaulk the lock plate. (a) Lightly tap the bracket of the radiator (or radiator hose inlet or outlet) with a plastic-faced hammer and remove the tank. (c) Remove the oil cooler (d) Remove the 2 O-rings from the oil cooler. 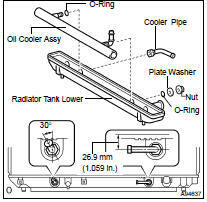 (a) Clean the O-ring contact surface of the lower tank and oil cooler. (c) Install the oil cooler to the lower tank. (d) Install the plate washer and nut. Torque: 8.34 N*m (85 kgf*cm, 74 in. *lbf) (e) Install the pipe. Inspect the lock plate for damage. (a) Install the punch assembly to the overhaul handle, inserting it into the hole in part A as shown in the illustration. If not within the specified height, adjust the stopper bolt of the handle again and caulk again. HINT: On radiators with resin tanks, there is a clearance between the tank and lock plate where a minute amount of air will remain, giving the appearance of an air leak when the radiator is submerged in water. Therefore, before doing the water leak test, first swish the radiator in water until all air bubbles disappear.